1. Wash and peel beetroot, carrot, ginger and chop into chunks. 2. In a mixer or blender add beets, carrot, ginger, salt and blend until everything become smooth puree add water as required. 3. Strain the juice if you prefer add lemon juice and more water if required. Adjust salt if required. ~Now how much water is depends on how you like your juice to be. You can add upto 1 litre of water; just add more of lemon and salt. Garnish with lemon/Cilantro or Mint, serve chill or with ice. Enjoy the drink and it's better to consume it on the same day. I also added chaat masala and it taste good. Never had tasted beets juice,nice combo with carrot too,healthy! Nice recipe priti! I am really loving that..tempting colour...healthy too..slurrrpp.. I love the drinks which are vibrant...and the colour of this drink is amazing...sounds delicious too. Wow wat a incredible juice, sooo catchy and colourful..
What a nice way to beat the heat...Very refreshing n flavourful. Never had beet juice so far..Looks like a drink that should not be missed out on!! Love the rich color too..
Now i got the answer...I tried once that ABC juice,have to try this...luks very colourful and delicious...Nice clicks. Healthy and delicious juice.. looks amazing !! This sounds like a perfect drink for summer..looks great.Thanks! Beet and carrots makes wonderful combo. Looks awesome juice, healthy too. So colorful, healhty and refreshing drink..
Never tasted beet juice before. I guess I must try it. It looks lovely. 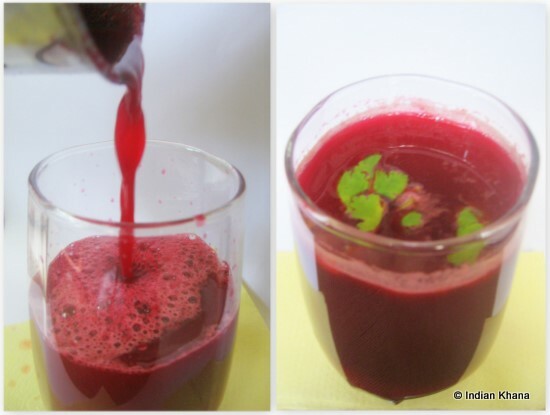 never tried a beet juice before....so colorful and refreshing...seriously drooling over these pics ! That is exactly what you need when you get home from the scorching heat outside- lovely colors! A colourful and healthy drink for the summers. I love it. This is a yummy and healthy drink full of beta carotene and anti-oxidants Priti - I make a veggie juice every once in a while - Love the colors - super drink! nice colour juice! must be yum! I love beet and vegetable juice. Yours looks delicious and I'll have to give it a go. Have a great weekend!